Mozambique was celebrating more than just the festive season this past month. 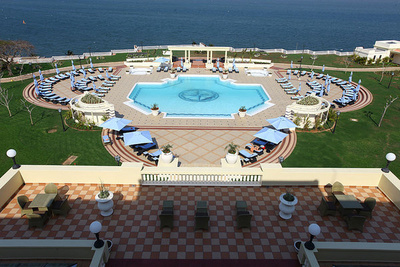 That is because Maputo's famous Grande Dame, the Polana Serena Hotel, a historic water-front landmark in Mozambique's capital, Maputo, and one of Africa's grandest colonial era hotels, has just reopened following a massive refurbishment. Situated in the heart of Maputo on four hectares of lush grounds, the 142-room Polana has long been regarded as one of Africa's leading hotels. Built in 1922, it was conceived as a luxury venue that would be a national landmark in the city. It was then called the Lourenço Marques, after the Portuguese trader and explorer who founded the settlement in the 16th century. The hotel quickly became a historic and cultural haven and a meeting place that offered unique elegance and grandeur. His Highness the Aga Khan, Imam (spiritual leader) of the Shia Ismaili Muslims and Founder and Chairman of the Aga Khan Fund for Economic Development (AKFED), the principal investor, was present at the inauguration last month. When it acquired the hotel in 2002, AKFED recognised the need to restore the property to its once iconic status. The Polana underwent a multi-year programme of improvements, upgrades and enhancements that consciously sought to restore it to its former splendour. The Aga Khan noted that the Serena Group everywhere contributes to the economic progress of all the countries in which it operates, and that the intention is the same for Mozambique. "World-class travel facilities can be crucial components of what we call 'an enabling environment,' a setting in which additional development initiatives can take root and thrive," he said. Prince Amyn Aga Khan, who is the Aga Khan's brother, and Chairman of AKFED's Executive Committee, said the new hotel was meant to be one of Africa's finest. "The Polana Hotel has the status of an icon — one of the few hotels on this continent that can claim to have that status and one of the very few in this part of Africa," he said. During the opening ceremony, Prince Amyn was presented with the ISO 14001 certificate for the Polana Serena Hotel by Mozambique's renowned biologist and writer Mr. Mia Couto, in recognition of the hotel's grey water recycling system, which produces quality water for the gardens from the hotel's waste water. The hotel is the first hotel in Mozambique to receive this certification. The hotel also received the "Made in Mozambique" seal, which recognises its commitment to ensuring that everything it does, reflects the best of Mozambique's values of hospitality, service and quality products, and that it continues to contribute towards the strengthening of the country's culture and economy.